Seattle's transportation brass will share a stage with Denver decision-makers at next year's Moving People Forward conference. Denver should look up to Seattle, a city where decision-makers are reshaping streets in a way that prioritizes transit, walking, and biking before driving, and invests heavily in sustainable transportation. The result is a city that has grown at a similar pace to ours, but has done so without adding traffic. Not so much here in Denver. While our newer residents probably arrive with a car, Seattle offers plenty of options to live without one. A ghastly 70 percent of Denverites commute by car alone, while only about 48 percent of Seattleites drive solo, according to the U.S. Census Bureau’s American Community Survey. That’s where the Hancock administration hopes Denver will be in 12 years. The contrast between Denver and Seattle should make for an enticing Moving People Forward conference in February 2018, Bicycle Colorado’s annual event on the future of transport in the state. The advocates just announced Kubly as the keynote speaker and opened registration. He’ll join Seattle City Traffic Engineer Dongho Chang, newly appointed Denver Public Works Executive Director Eulois Cleckley, and Denver Metro Chamber President and CEO Kelly Brough for a discussion about how to move from the bureaucratic refrain of “balancing” all modes to “prioritizing” the ones that curb solo driving. City Council President Albus Brooks will moderate. Kubly recently gave an interview to Streetsblog, sharing how Seattle bucked the national trend of falling transit ridership and repurposed streets for more efficient and healthier transportation. Hint: It takes political courage to bypass the haters aching to preserve the status quo. Money helps, too, and so does getting things done quickly. “Literally nobody argued because it’s so readily apparent that you’re carrying more people with transit than you are with cars,” Kubly said. Kubly says turning the ship is about framing the problem simply, realistically, and in pragmatic terms. In the end, moving people through limited space efficiently is about geometry. Imagine repurposing a car lane for buses on any downtown Denver street that quickly and sensibly. Broadway’s new 24-7 bus lanes took less than a year — after winning a grant — but they were rush-hour bus lanes to begin with and buses still have to share them with cars. Speaking of rapidity, remember the Broadway bike lane — a half-mile protected, two-way bikeway between Bayaud and Virginia avenues? It’s been in “test” mode for a year-and-a-half and may not extend to the Cherry Creek Trail until 2019. While demos are nice to show the public what a street can be, it’s best if elected officials and bureaucrats act fast, Kubly says. “A lot of times there’s this belief that if you go slower and you talk to more people it will make the change easier and people will be more happy with the end result,” Kubly said. “And I would actually flip that on its head and say the exact opposite is true — that the faster you move, the less opposition you get and the more people just sort of accept that as the new status quo. Another huge difference between Seattle’s and Denver’s transportation scene is funding. Changing streets takes money, and the Seattle region has a lot of it. Leaders have asked voters to fund solutions to traffic, and voters responded to the tune of $54 billion last year, and $930 million in 2015, while the Denver region is still resting on its $4.7 billion FasTracks laurels. Denver proper approved $431 million for transport improvements this year, but about a third is going toward road maintenance and widening 56th Avenue. Putting Seattle’s brass alongside Denver’s at Moving People Forward in February should make for an enticing conversation — and a learning opportunity for Denver. Let’s hope decision-makers like Mayor Michael Hancock are listening. It’s also important to understand the differences between Seattle and Denver. For starters, Denver doesn’t have the Bell Cow that Seattle has in Amazon. Amazon is trying to accumulate 10 million square feet of office space by 2019; that’s the equivalent of downtown Denver adding ten “cash register” buildings. Consequently Seattle has twice the number of cranes in the air and they were a lot more dense to begin with. Seattle has a below grade transitway and I’m all for Denver looking into a subway running between DUS and the Civic Center Station. IIRC all of Seattle’s RapidRide routes take off from downtown; they don’t have two bookend transit hubs like Denver has. But I’m not averse to downtown having dedicated transit lanes. I’m not aware of whether Seattle has still developing ‘suburbs’ like Denver has with Stapleton and GVR etc. 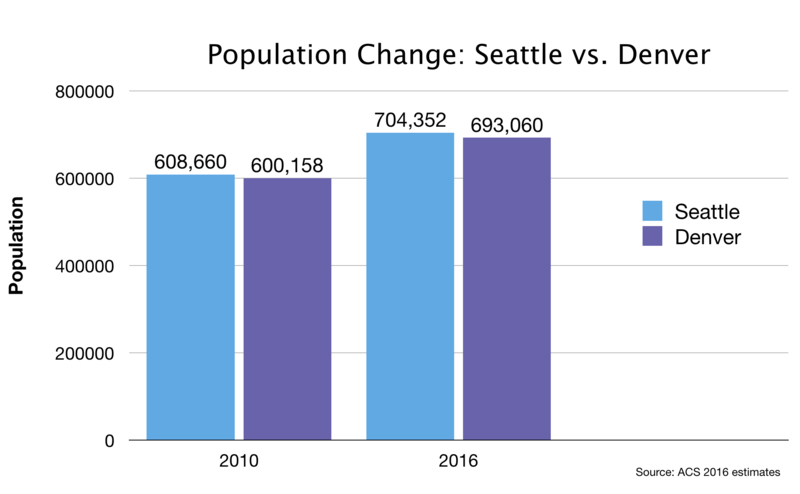 But again Seattle has higher density to begin with. Aside from my own (self) promoting a $15.5 billion metro transportation plan to voters I’ve yet to see anyone else take up this cause including this blog. This is what Denver could learn from Seattle. They need both a large metro funding plan along with City of Denver’s own efforts. Between City of Seattle’s $930 million and ST3’s $54 billion which would you suppose is the more meaningful? I don’t think Seattle has much pull outside of its city limits. The topography kind of limits its growth. It is bounded on the east by Lake Washington and on the west by Puget Sound, plus it is cut in the middle by the Ship Canal. As far as suburbs growing, that also has a limiting factor, they are called the Cascades and Puget Sound. On the east side there are costs to building roads in the mountains. West of Seattle requires the use of ferries, and if there is one thing I have learned by living here for over forty years is to avoid traveling over a bridge. Unfortunately that is unavoidable, especially since there is no way to from downtown to more of a third of the city without crossing the Ship Canal. Did I mention both the east and west city boundaries were actual bodies of water? Seattle is a bit more vertically challenged than Denver, “The Queen of the Plains.” Here is an example I use to illustrate the issue: Seattle City Hall entrance at 4th Ave is on the first floor, to get to the 5th Ave entrance in the same building you need to go the to fifth floor (fortunately there are both elevators or a lovely lobby with lots of escalators to get you there). Hence the use of underground tunnels for both highways and light rail (one of which goes under the Ship Canal!). I noticed many of your suburbs extended to the east, and not to the west (where you can drive up a mountain to an altitude higher than the peak of Mt. Rainier, your mountains’ altitude is masked by the fact that they start in the high plains and not sea level, and don’t tend to blow up). My big brother lives in one of those suburbs just south of the City of Denver. Sad to say I only visited my brother’s Colorado home over fifteen years ago. He was quite proud of the region’s new light rail system. He made sure we got see Denver by having us go from Englewood by light rail, and then transferring to a bus to go to the Downtown Aquarium (which was then Colorado’s Ocean Journey). I moved to Seattle over forty years ago as a college student. It was then just a town struggling to be a city (this was after the Boeing crash). Since then I have seen it become city, with all of its growing pains. There are good points (we are within walking distance of light rail), and bad points (we cannot move because we cannot afford to downsize, plus find housing for disabled adult child). Denver should welcome Amazon! Have fun with that. Gratefully, I expect Amazon to go east of the Mississippi. Many are betting on the NE but the SE beckons for reasons so we’ll see what happens. Stapleton, Lowry, and Green Valley Ranch are actually Denver city neighborhoods that are still developing. Both Stapleton and Lowry used to be major airports within Denver’s city limits but both were closed and have become urban neighborhoods. Lowry was an Air Force Base while Stapleton was Denver’s major commercial airport before DIA opened. Denver is unusual in that it wasn’t hemmed-in by its suburbs until the city had managed to annex 10 miles out to the southeast, southwest and almost 24 miles to the northeast. Green Valley Ranch is a Denver city neighborhood south of DIA Airport that is further from downtown than many suburbs are. DIA is also within the city limits and the terminal is 22 miles from downtown via any road. To the west and north Denver only goes 3 miles from downtown before reaching suburbs. We are already welcoming a giant Amazon warehouse in our far north suburbs right alongside I-25 so a giant Amazon office complex nearby would be a perfect complement, especially if RTD would figure-out how to finish our long-promised North FasTracks rail mass transit line to help carry some of the demand. Residents of Denver might be interested to know that mostly due to a hilly terrain and occasionally to various bodies of water, only ONE, count it, one east-west street (Madison Street) touches both Elliott Bay (Puget Sound) and Lake Washington in a continuous stretch. And the only TWO roads which completely bisect the city north and south are both highways, Interstate 5 and State Route 99. Yep, Seattle is a tough city to drive in.